In this course you'll gain a clear idea of the path to enlightenment, especially its three main components: renunciation, bodhichitta, and the right view of emptiness. You will understand the progressive, step-like structure of the Lamrim, its origin in the teachings of Guru Shakyamuni Buddha, the three scopes, where you fit at your present stage of spiritual development, what you need to do next, and how you get from there to enlightenment. 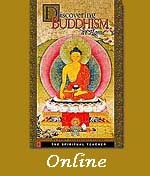 A 26-minute video for Module 3 from the Discovering Buddhism DVD. Eight teaching sessions and three guided meditations taught by Ven. Robina Courtin. A description of the content of these sessions can be seen in more detail below. PDF transcripts for all these teaching and meditation sessions are also provided.